From the very beginning as a political organization Reagrupament Independentista (RCAT) has been insisting in the need for Catalonia to set off on a way towards sovereignty and political freedom as many other free nations did. 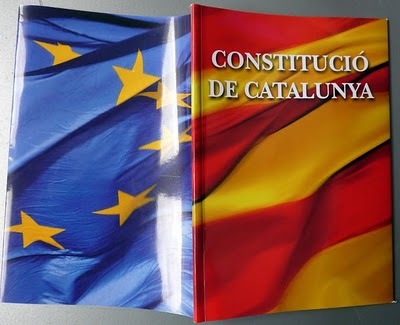 To reach this goal Catalonia must have its own constituency as an independent state and therefore will have to indulge itself with a democratic Constitution. That’s why almost three years ago, at the beginning of 2010, RCAT wrote down and presented a Catalonia’s Constitution project by which, with the help of some expert jurists and lawyers, Catalonia’s great constitutional tradition was vindicated –a tradition suddenly interrupted by weapons of a foreign king and army in 1714- to which were only added all the necessary adaptations to our contemporary world. This medieval sentence from Catalan Usatges -today still valid- was the starting point to open our debate in order to try and find a modern instrument by the help of which our country could be able to face up, in better conditions than the present ones, the challenges of the future which certainly have their risks but are also full of hopes and chances. Defining a constitutional purpose for our nation was not a frivolous exercise. On the contrary, as time goes by we found more reasons to value a project which is now more important and necessary than ever before. To prove that just look at the critical situation to which the educational system in Catalonia has come right now, concerning the teaching language and contents, under the intrusion of an outlandish power which has nothing to do with our country’s democratic majority. No one should think that Mr. José Ignacio Wert, the Spanish minister of education, is just a snipe shooter, someone isolated individual out of his mind. On the contrary, Mr. Wert wants to implement a program, widely backed by his political party and even by many others out of it, which has the unconcealed intention to weaken Catalan language and culture in the same way it has already been done in Valencia and the Balearic Isles where they are kept at present in a severe situation of extreme weakness. All the more the Spanish government is doing this not in hidden way but in daylight since they are just strictly implementing what has previously been dictated by some Spanish courts in such sentences as the one given by the Constitutional Court concerning the updated Statute of Autonomy after it had already been approved by referendum in Catalonia. Anyway, this attempt of destroying the Catalan educational system is though only consistent with the Spanish constitutional project. So Catalonia does need and must have, just for surviving reasons, its own Constitution which will provide us with the only democratic way to organize our national community. Since 2010, our country has decisively taken some steps forward, a good example of which is the resulting Parliament after the last elections we have so recently had. A wide majority of our MPs are now favourable to held a self determination referendum for Catalan citizens to decide on their future and they are also favourable, if that is the case, to provide our country with its own Constitution as to guarantee all our rights and duties as citizens of a free nation. We would like to have then a good relationship with our Spanish neighbours and even congratulate them on their Constitution’s Day. Right now, as you can easily understand, we cannot celebrate it until we, Catalans, can also have our own one as a respected democratic free nation.